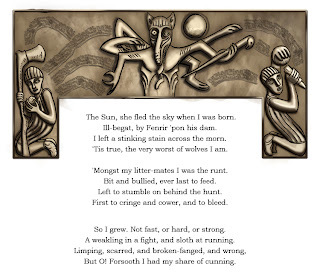 A text version of the poem can be found below the illustrated pages. The Sun, she fled the sky when I was born. Ill-begat, by Fenrir 'pon his dam. I left a stinking stain across the morn. 'Tis true, the very worst of wolves I am. 'Mongst my litter-mates I was the runt. Bit and bullied, ever last to feed. Left to stumble on behind the hunt. First to cringe and cower, and to bleed. So I grew. Not fast, or hard, or strong. 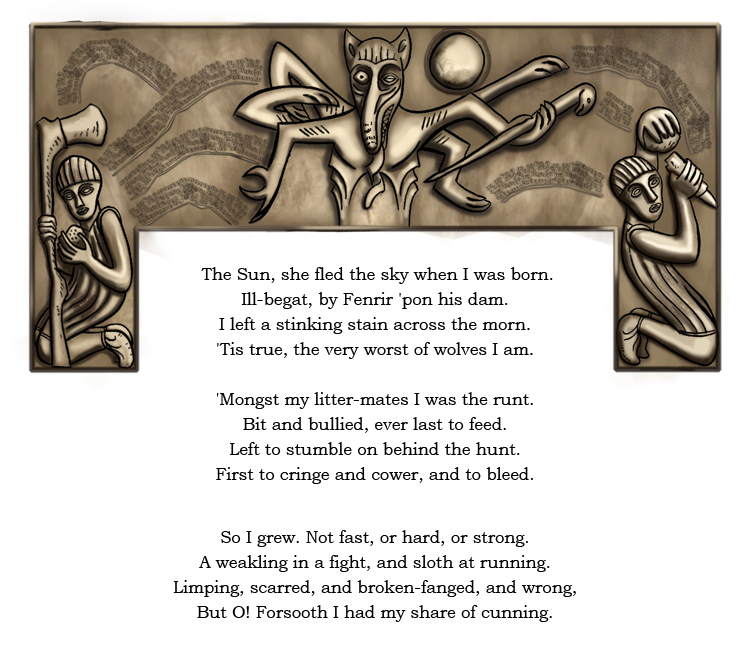 A weakling in a fight, and sloth at running. But O! 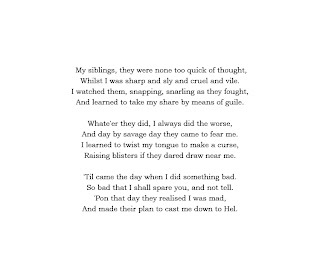 Forsooth I had my share of cunning. 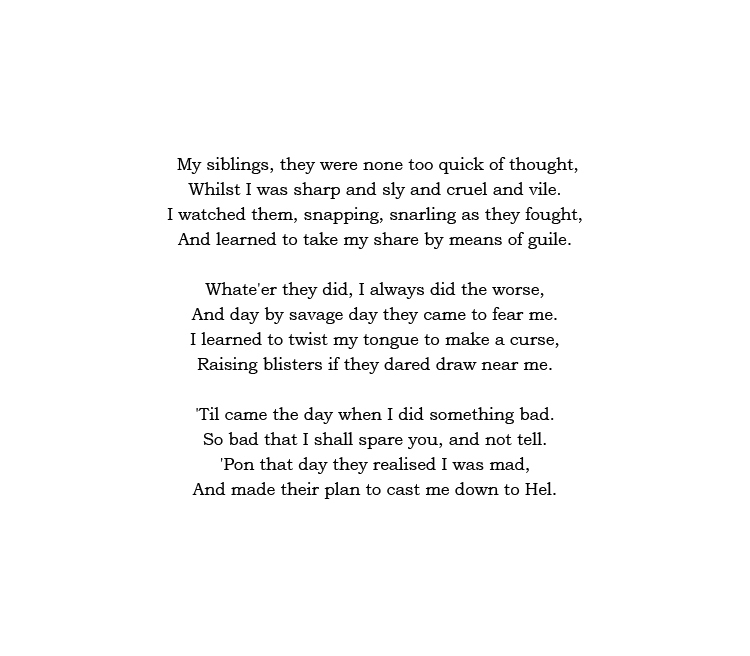 Whilst I was sharp and sly and cruel and vile. And learned to take my share by means of guile. And day by savage day they came to fear me. Raising blisters if they dared draw near me. 'Til came the day when I did something bad. So bad that I shall spare you, and not tell. And made their plan to cast me down to Hel. They broke my bones, and hauled me to a cave. In gravest hope that none should ever find me. That brought a ruined whimper in the dark. I heard her grating voice inside my head. Then all I knew was that infernal smell. She taught me much as I lay in my tomb. Her darkest secrets were to me laid bare. I lay there listening, breathing in her fume. An age passed, and my tomb became my lair. Miners seeking flint had broached the cave. 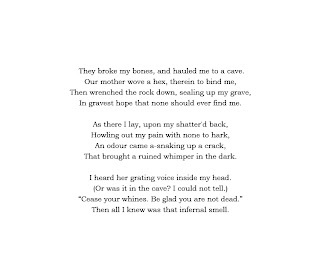 Then gather'd in and dragged me from my grave. Slow of wit, and barely more than beasts. Until, corrupted, they became my priests. And with it, burn and blister, and to kill. And drag him wrenched and swollen to their will. And twist them to knot of rage and dread. 'Til all his kinder urges have been bled. 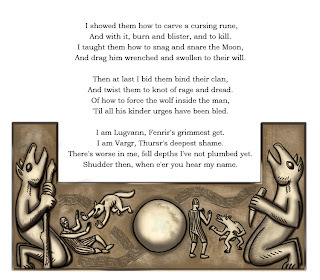 I am Lugvann, Fenrir's grimmest get. 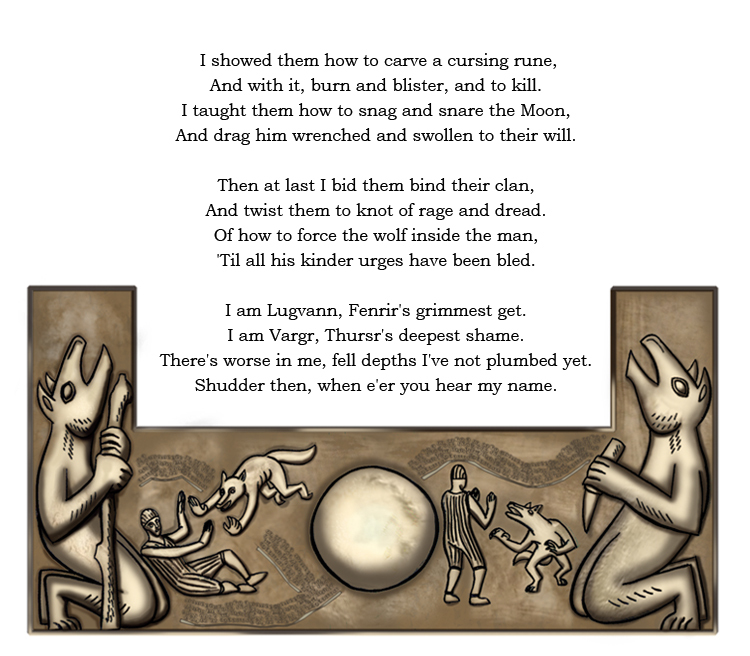 I am Vargr, Thursr's deepest shame. There's worse in me, fell depths I've not plumbed yet. 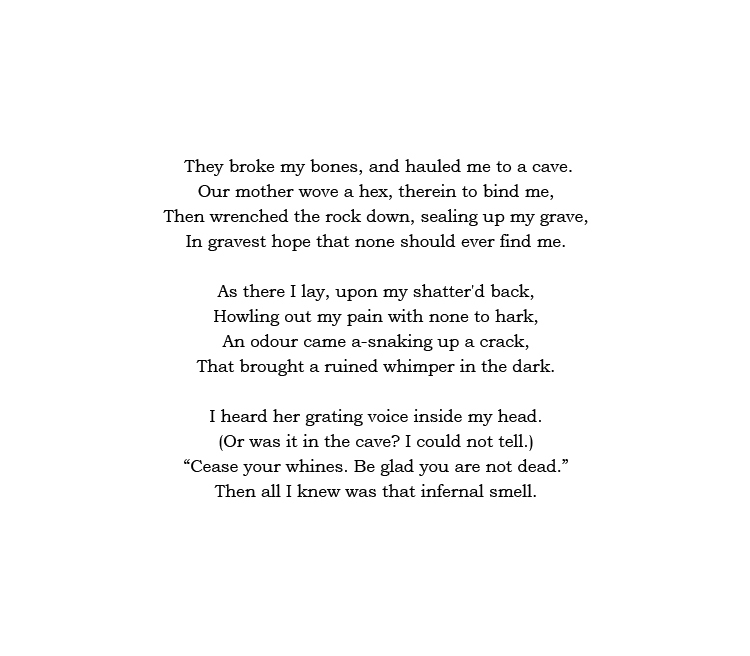 Shudder then, when e'er you hear my name.